Blogging is definitely not easy, but there are so many mistakes that are easy to make with each and every post. Like I shared in 5 Things I Learned in My First Year of Blogging, maintaining and growing a blog is a lot of work, and there is always something new to be learning and mastering. As bloggers, we've got to give ourselves a whole lot of grace, and constantly reflect and learn from our mistakes. Here are eight mistakes I'm guilty of making, how I'm learning from them, and how they can be avoided. From the start, I'd spend time writing a post I was proud of and excited about, but then I would just sit and wait for people to read it. I had a Facebook page, Pinterest account, and Instagram account, but I wasn't using them to promote content regularly. As time has passed, I've had to teach myself that sharing content on social media and asking people to follow along was a good thing. Of course, I want to find a good balance and not over-promote, but I've got to share what I write if I want people to read it. As bloggers, we can't be shy about promoting our work. It's easy to feel like you're not posting enough when you see lots of fabulous blogger and writers posting multiple times a day. But as someone who works a full time job outside of blogging, it's just not realistic for me to blog more than a few times a week. I've finally landed on about two posts a week, and I think it's consistent enough but also manageable. I also have to give myself grace in the fact that sometimes I may only post once a week. We've got to be flexible and focus on quality over quantity. I think there's something so important about being vulnerable and real with our readers. After all, that's the heart of this blog in the first place. At the same time, when sharing personal posts I have to remember that my audience needs to find something of value in my post. Sure, it's fun to follow along and learn a little more about my life, but if the reader doesn't learn something, think in a new way, or find what I say to be valuable, then they won't come back to read more another time. As bloggers, we've got to ensure that we are giving our audience something worth reading. In the world of blogging, it is so, so easy to let numbers and page views and followers seemingly shape your worth. I've found that it's easy to get frustrated or impatient about growth in social media or other types of follows. But you know what? I didn't start blogging because of page views. Sure, I want people to read what I write. But I'm still learning and growing and figuring it all out, and I can't solely determine my success based on a series of digits. If I do, it's easy to doubt myself and feel like I'm too scared to really go all in with blogging. We've got to give ourselves grace and room to grow in this area. This one is Pinterest specific, but it's so important. I love including lots of great images in my posts, but I often forget to include a vertical image that can easily be pinned and shared on the web. Pinterest loves vertical pins, and I hurt myself for the first year and a half by only sharing horizontal images. I should probably go back and update these images, but I've yet to square away time to do it. Word to the wise, get those vertical images in the first time around! You definitely won't regret it, and will see huge growth in engagement. I think it's just human nature to constantly compare ourselves (and our success) to others. When it comes to blogging, there are so many others out there that it can make you feel like a total failure on a daily basis. I constantly have to remind myself that other bloggers are knowledgeable, valuable, potential friends who have much to share- and I have much to learn. I've always loved the statement "Don't compare some your beginning to someone else's middle", and it's so true. Just because I've got fewer page likes or Instagram followers doesn't mean I have to be disengaged with or jealous of another blogger. It's much the opposite- that bloggers have to unite and provide community for one another. The struggle with newsletter subscribers is real, y'all! Anyone else feel my pain? I started out promoting my newsletter subscription and getting some people on board, but I honestly have done nothing with it for months and I've totally neglected those who have signed up. I guess I feel like it's just one more thing to do. I know it's important though, so I'm working to be more consistent in this area. Any tips from you bloggers out there? Another area where I've really dropped the ball is when it comes to consistent SEO optimization. Sure, I like to think of good titles and the occasional keyword, but I really haven't done a tone of research or focused much on optimization. Although it isn't the end all to blogging, I do recognize that it could help bring readers and success to my blog, and thus I need to dedicate a little more time to it. That's on my list of goals for the next year. What mistakes are you making in the blogging world? How can you make some changes to bring fresh life and success to your writing? I'm all about learning from others, and would love for you to join in the conversation with a comment below, or on the Currently, Kelsie Facebook page. 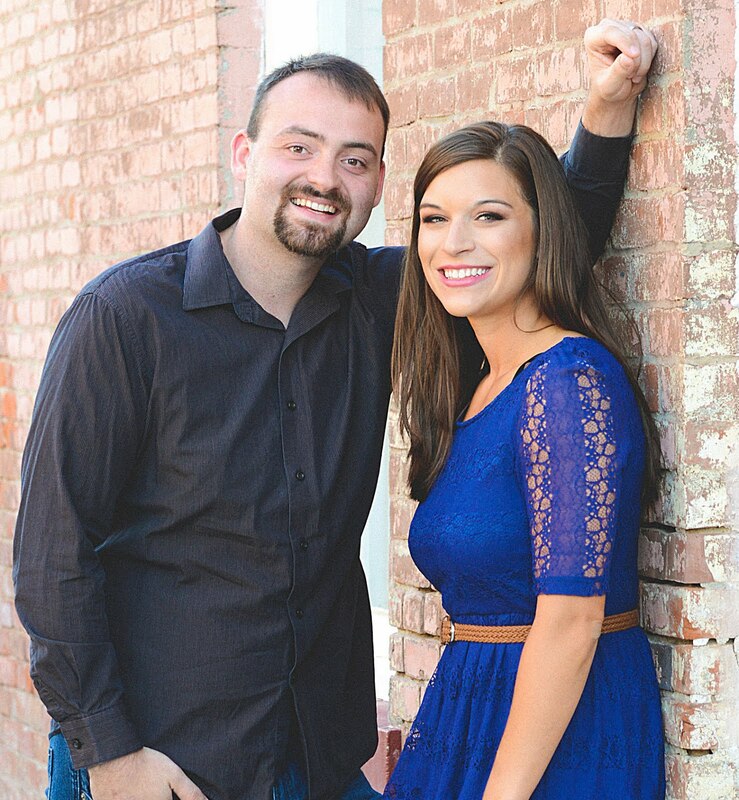 I'd love to have you follow along! Cheers to community and meeting the needs of our readers with renewed success and excitement. Awesome post! I have made all those mistakes too on my blog. Like you said, give yourself grace. I think when we start looking at other bloggers and comparing ourselves and our blogs to others is where we start to devalue our own blogs as not good enough. I love this post! I'm guilty of focusing too much on one or two areas and completely forgetting about others...like Pinterest, etc. Some of that comes from time issues...but I just need to set it as a priority. Thanks, Jennifer! Amen to that! I'm right there with you on #7! I've never sent out a newsletter...yikes! It's one of my goals, but I'm not sure how to even get started. I use mailchimp, but I'm horrible at doing the newsletter regularly! I'm SO guilty of doing 1 or 2 things and then neglecting everything else. Sigh. I'm definitely guilty of a few of these, though better than I used to be for sure! I agree- it's a process! Awesome post! Definitely guilty of most of these, especially being scared of sharing my work. Good to know I'm not the only one. Keep it up! You definitely aren't alone. Thanks for reading! Trying to post too much is my struggle. I need to back up and create meaningful posts instead of just posting to meet my goal. I'm also trying to step up my newsletters! I definitely call flat in most of these categories. I'm working on becoming more engaged with my audience and not being so afraid to promote my work. It's a hard balance, and we just have to keep working! yep! I have done all of these as well. Thanks for the important reminder that it is not all about the numbers. I have to check myself about this often. No problem- thanks for reading! I have 100% done all of these! I was just thinking about the vertical pins this morning, I need to go back and add some to old posts! I really need to go back and do that too! So many of these are true for me too. I have really struggled with my newsletter, letting the numbers rule me, and trying to post too often. Thankfully, I've got a good post schedule going, but I still need to work on the other areas. That's great! Keep working hard! YES to the vertical pins! It drives me crazy when I come across awesome content but there is no "pinnable" image to share! Great read and I am a offender of every one of them lol! These are all so true! I work 3 jobs and am finishing my masters degree on top of blogging. I posted once last week and probably won't post this week - I usually post twice a week. Due to this, I haven't sent out out a newsletter. I feel so guilty but I am reminding myself that a lot of my master's work is due this week and so I need to focus on that. Once I graduate, I can really push out great content on Glitter & Grandeur (my blog). I am obsessed with page view increases and not posting, doesn't help with that. This post helped me remember that I'm not alone and it is okay to go at my own pace. Thanks, love! Dang girl, you rock! It's definitely okay to take it at your own pace, especially when juggling other things! I totally relate to this! I usually post 4-5 times per week, and most of the time that doesn't stress me out because blogging is what I love to do and how I spend a lot of my free time is writing. But sometimes if I can only get 3 or even 2 posts up in a week I'll be really hard on myself, when it's actually totally fine! Yeah I would say 2 or 3 a week is great! Blogging is hard work that is for sure! I have been guilty of all of these as well. I know when I first started blogging I would compare myself to other bloggers. I slowly learned that was not going to help me at all. We are all great bloggers for different reasons. It's not about competition. I also in the past used to get upset with my numbers. Now I just tell myself that numbers are important but they are not everything. It definitely is! And it's so not about competition or numbers!! #6 is very important, I think! It's true that there's no limit on how many awesome bloggers there can be in the world, so it doesn't make sense to treat others as competition! I think that's one of my biggest ones! I'm guilty of two of some of these. I need to start doing the newsletter more often. Great list! Yes it's easy to make these mistakes. I'm still working on some of them 5 years later :) Sounds like you are on a great path now! I'm trying! It's definitely a process! I've got to work on SEO! Great reminders. I only post twice a week a well and I just can't do more so there you go but I hope what I so post is good content! Thank you for the hints! Thanks! I agree- better content over more content! Vertical pins! Yesssss. I was stubborn about it but finally made the switch and redid all of my pins. It was sooooo worth it! I need to take that leap and do it! This is such a great post! The first 8 months of my blog, I hardly posted any vertical images on my blog and I haven't taken the time to repost. I really need to though. And I have the same problem where I kind of forget my newsletter subcribers. I really need to be better. Girl, do NOT be afraid to promote yourself...you are SO talented with such a great voice and sweet space on this world wide web, and the internet needs you! Yes, to so many of these! I used to think I needed to blog DAILY (lolz) and now I realize that quality is SO much more important than quantity. I also don't stress so much over numbers and stats; as long as I'm happy with the content and feel proud of my work, that matters more than anything! Ha! I don't think I could ever do daily! Definitely the numbers point, it's so difficult! It's hard not to obsess over it because it's also one of the exciting things about blogging- your audience. These are such great tips! I find as a blogger who has been blogging for almost four years that I go in stages of committing these blogging mistakes at different times. Definitely a post to keep re-visiting and thinking through! Thank you so much for sharing! Thanks! I agree for sure. Thanks for reading! I needed to be reminded of them too. You got it! I'm definitely guilty of a few of these! I pretty frequently forget about my newsletter subscribers, unfortunately. I also pay way too much attention to numbers! For sure! I totally agree! I've been guilty of a few of these as well! It's easy to get caught up in the drama of blogging, but the truth is that you are amazing! Thanks for sharing! Bloggers are awesome! Thanks for reading! This is so good and such a great reminder to me! Especially with rembering my worth but also seeing others as community not competition. We can all have successful blogs together! SEO is on my list of things to try to understand for next year too! I am guilty of each and every one of these! All this! Oh my! As I was reading and agreeing with each thing on the list, I realized I need to focus a bit more! Thanks for sharing! Thanks so much for reading- glad it was helpful. I'm especially guilty of the Pinterest one and forgetting my newsletter subscribers. I never want to bombard them because I know I just unsubscribe to those kind of newsletters. But, I do need to step it up a little. So true! I know just what you mean! This is so relatable! Trying to post too often was the biggest one for me I think! Love all of this, Kelsie! It's so important for us bloggers to be vulnerable with one another in areas like this! Vertical pins are huge!!! i'm totally guilty of 4, 5, and 8! doing pins is one of my least favorite part of a post. it's so time consuming for me! Gosh I know! I'm so indecisive! I can so relate to these! I get bummed out about numbers and allow poor numbers to ruin my day/week. I too get afraid to promote my work. I get too inside my head and it really hinders me. I really needed this post today! Thanks for sharing this! Me too! Glad it helped and thanks for reading! So much #8 for me and I'm paying for it big time. I could NOT agree more with every single one of these! I think we're all super guilty of being too hard on ourselves - and I know for a fact I am too! Trying to post more often and getting stressed about it is something I go through weekly. Love this!!!! I SO agree! Thanks for reading! I think it definitely takes time! I have struggled with ALL of these things; especially with SEO and trying to view others as community, not competition. It can be so easy to compare your success to others and get down about it, but I'm trying to remember that I am unique and no one can do exactly what I can do! Love your blog and your honesty! I love that! Thanks for reading and for sharing, Chels! I am guilty of all of these. When I first started I didn't want my coworkers or friends to know. When I finally let go of that the response and support made me wish I'd done it sooner. That's awesome! We can't be afraid of it! 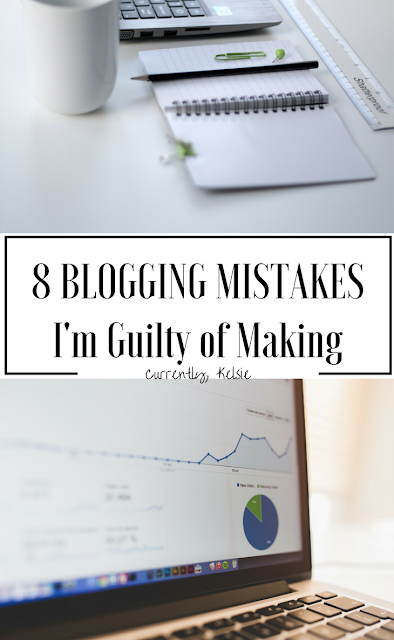 I feel like we've all been guilty of making these mistakes at some point in our blogging career! SEO is a huge one! I think we all run into these from time to time, especially in the beginning when there is so much going on. After time though, everything gets more routing and it becomes easier to maintain the right focus. I have been guilty of all of these mistakes at one point or another. 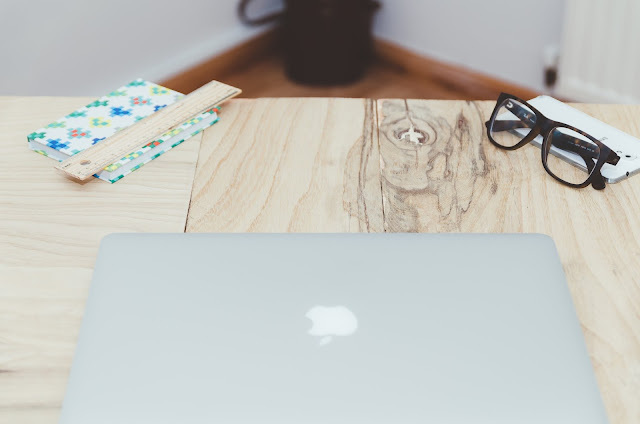 Finding that perfect balance as a blogger is an ongoing process. You have to be mindful of your mistakes and work to keep improving without beating yourself up all the time. Great tips for bloggers of all levels! I totally agree! Thanks for reading- I am so glad it was helpful!